British understatement | Notes from the U.K. Neither do I, so I went running to my strange friend Dr. Google and found a 2001 Guardian article, which gives a memorable example of what happens when the British and non-British try to communicate. More than 500 British soldiers were captured and 59 were killed or missing. Only 39 escaped. So, yes, I can see why Zipfslaw’s question is worth asking. 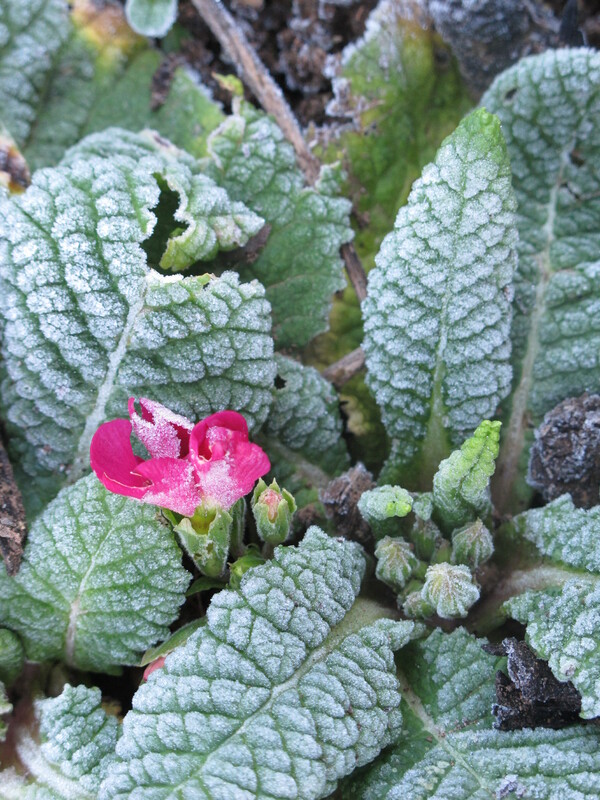 Irrelevant photo: a primrose in bloom on a frosty morning. “A quality that is much revered – and exploited – by the British, understatement is frequently seen as being synonymous with good manners. Understatement is characterised by a number of negatives: a refusal to be effusive, overdramatic, emphatic or didactic. More direct remarks are frequently accompanied by tentative or provisional qualifications: ‘perhaps’, ‘it could be’, ‘I wonder if’, ‘maybe’. The overall effect is an aura of modest reticence, quiet understanding and considerate behaviour. Like self-deprecation, understatement is an attractive and effective quality, which is often more persuasive, and appealing, than a direct approach. J. told me about a scenario in which an aristocrat offers a working class person a lift, expecting to be politely turned down. But the working class person thinks it’s a genuine offer and accepts it. Inevitably, it would be raining. I’d have accepted too. The aristocrat would be put out but too polite to say so, and I’d have no idea I just broke the rules. Subtlety’s wasted on me. At roughly the same time, a different friend whose name also starts with J. sent an email saying something I’d written wasn’t half bad, then added, “(British upper class understatement from 1930s). In fact its a jolly decent letter. This is probably a good place to note that “not bad” (depending on the tone of voice) can mean very good, but “not terrible” means bad, although probably not disastrously so. As people used to say in the U.S. when I was a kid, you can’t tell the players without a scorecard. I only threw that in because I suspect it’ll be as baffling to anyone who doesn’t already understand it as the not bad/not terrible distinction is to the rest of us. I was beginning to think that you’d have to grow up with this to understand it, but then I found Anglophenia, which along with a few other sites ran a translation chart for a range of phrases. As an example, “I’ll bear it in mind” means I’ve already forgotten it. Before you decide that expanding your head so it encompasses understatement is all it takes to understand people over here, I’ve also heard classic British overstatement. Friends periodically tell me they’re gasping for a cup of tea, although I have yet to hear an actual gasp. Or that they’re perishing for one, although so far none of they have died when no tea materialized. But then I don’t (thank whatever laws of the universe control these things) hang out in Debrett’s kind of circles. I’d add more examples here but the only Briitish overstatements I’ve been able to think of involve tea. That’s worth pondering. So all I can say in answer to Zipfslaw’s question is, Consult your translation chart. It’s incomplete, but that may be a result of classic British understatement. Apologies to anyone who read this a week and a half ago when I accidentally posted a draft. Since then, I’ve moved three commas, put two of them back where they started, removed a stray URL, and added a photo. You can see, it’s a massive improvement. I’ve also added J. emailed comment, which is a genuine improvement. Finally, this P.S. gives me an excuse to mention another crucial cultural difference between the U.S. and Britain that the Guardian quote reminded me of: We do the dash differently. American publishing uses what’s called an em dash–a dash the width of the letter M–with no space on either side. British publishing uses an en dash–the width of the letter N–with a space on either side. As always, I welcome your questions and comments. They take me places I wouldn’t have thought to go otherwise. This entry was posted in Intercultural Mayhem, Manners and tagged british overstatement, british understatement, minnesota understatement by Ellen Hawley. Bookmark the permalink. I actually spend more time pondering your editing of the draft (which made a very enjoyable post, by the way). I was wondering if you are a perfectionist, grammar fanatic, diligent writer, or … then decided it was none of my damn business and I do the same in any case. Well, since you’ve raised the issue: I do rewrite a lot, although I wouldn’t say I’m a perfectionist or fanatic about grammar. I did work as an editor, so it matters to me, but what matters more is the sound and flow of the piece. I used to read my work aloud before I sent it out into the world (this was, oh, a hundred or so years ago). I don’t anymore, but I can hear it in my head, and to the extent that I can I want it to be sayable, read-out-loudable, and close to what I’d say if I were talking but more coherent than I usually am in person. My comments, on the other hand, I sometimes even forget to reread, so a fair few typos sneak in. If I went over them three or four times, they’d probably be sharper, but there’s only so much time in a life. Overstatements? I used to live on your side of the Pond, so I understand that traveling by car from say, Oxford to Birmingham, is far more tedious than it is from New York to Philadelphia. However, there are some who make themselves out to be Scotts of the Antarctic when others have to make long commutes when traveling the same distance. I do hear people make distances that wouldn’t seem long in the U.S. sound much further. But I chalked that up to–well, the size of the country sets your standard of long. I guess. And you’re right, that driving is generally harder. On the other hand, you have a point about Scott of the Antarctic as well. Do I sound like I’m on all sides of this? I am. No argument on all your points. I just wanted to give you another example of overstatement that did not involve tea. Much appreciated. I think I’m responsible for slanting the sample there. This all makes me inordinately happy. I’m guessing context, tone of voice, eye-rolling (subtle, of course) all help in translation. I’ve not been able to read every comment so someone may have already made this point….. But when asked “How are you?” Most British people will reply: “Not too bad” which means good; or “Not to good” which means bad. A few years ago I decided to reply “I’m just wonderful thank you”. Inevitably this would make both of us smile and feel happy for a while! A friend who was a nurse (she’s now retired) says that when you ask someone how they are and they say, “Fine,” they’re not fine. If they say, “Good,” they are fine. I’m not sure if that only holds true in a medical context. How does anything ever get done in this country?? A response of “fine” is often a sarcastic response, and not limited to medical situations! It all makes me wonder how I’ve managed here for almost eleven years. Probably by thinking everything’s fine when it’s clearly not good. Or–well, something along those lines. I really enjoyed this treatise on understatement, Ellen. It was very enlightening. I do know the English sometimes do tend toward hyperbole (as in I am gasping for tea). Sometimes I wish we Americans could master the fine art of being understated. Good luck with that one. LOL! Thank you for my laugh moment of the day. Yes, it is only fabulous to see you if you are bringing me a million dollars or a really great cup of coffee. And nothing in between, like maybe a piece of chocolate cake? Right. So, the money, the coffee, the cake. You’re easy to please. Sure. I am actually, Ellen. The simple pleasures in life. Oh, yes. You did say money? Well…..
Wow–declining three times? That’s flirting with disaster if the other person doesn’t know how to read the signals. Fabulous article. Very funny. And as a (British) Southerner, who’s often been slightly taken aback (!) by others’ lack of acquaintance with DeBretts (not yours, I hasten to add), it was nice that you made the distinction between different bits of the UK. Perfect. I swear, there’s an art to it. Most of what we say is rooted in or based on irony. For instance if it’s raining enough to flood the street we’ll say it’s a “bit wet.” It’s certainly an understatement but the emphasis (and inherant humour) comes from the irony. I think we Brits tend to use irony as a connection to each other in the same way that families have their own meanings to common words and phrases that outsiders might not understand, so we use irony to bond together. ‘At your earliest convenience’ is a bit different in that it was originally formal language, used by people in authority, so when someone ‘ordinary’ uses it, it makes the meaning, (which is “as soon as possible”) condescendingly emphasised. If used out of context, it draws attention to the person saying it. There’s still a lot of irony used by Brits in the North of England but it’s based on their regional cultures. They are much more direct than southerners but that’s more in their attitude than anything else. As they put it, they don’t mince their words… what they want to say and do comes out plainly stated. Irony’s also used in the other regions of the UK.